Medical Malpractice attorney, Robert M. Clay, passed away Tuesday, April 10, 2018. Bob served as Of Counsel to Young Moore and Henderson. 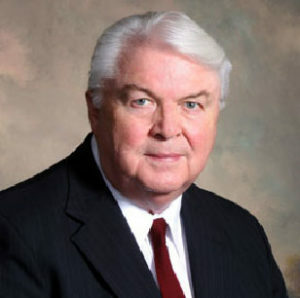 His practice focused primarily in medical malpractice defense, but Bob also handled complex litigation in administrative law before professional regulatory boards, liability insurance coverage disputes, products liability, contracts, employment law, and municipal corporations litigation. Bob Clay sought to become a civil trial lawyer and was overwhelmingly successful in his chosen field. Bob tried cases in most of the Superior Courts and the United States District Courts in North Carolina. He appeared in the North Carolina Supreme Court, the North Carolina Court of Appeals and the United States Court of Appeals for the Fourth Circuit in more than 70 reported decisions, and he was admitted to practice before the United States Supreme Court. Bob Clay was the “go to” guy for medical professionals, having represented most hospitals in Eastern North Carolina and having defended healthcare professionals in almost every medical specialty for more than 30 years. Throughout those years, the numerous forums and the hard-fought trials, his reputation as a good and decent, courteous and congenial advocate was never compromised. Bob knew that accuracy in research and in argument of facts will outweigh bombast, volume or loss of integrity. • Lecturer to medical groups, insurance risk management groups and legal groups on a wide variety of subjects, including medical negligence litigation, products liability, the rules of civil procedure, the code of evidence, insurance coverage, risk management, and recent changes in the law and recent decisions of the Courts. • Author, book chapters, “Anatomy of a Lawsuit” and “Matters Before the Medical Board,” in the text Medical Malpractice – How to Prevent and Survive a Suit, 2005. Although there have been many verdicts of which he was proud, he was more proud of the young lawyers he mentored over the years. Several Raleigh law firms count their origins in the mentoring and training received by their founders as associates or partners with Bob Clay. He practiced with many good lawyers whom he regarded as brothers and sisters. He especially treasured his years with Ed Johnson, Grady Patterson and Ron Dilthey. When he first started, there were very few female lawyers in private practice, but he believed that the women lawyers with whom he worked are the equal of any lawyers anywhere. Although he was very proud of all the lawyers he helped to grow, he admitted a slight bias in favor of the women, as they had more to overcome. In 2007, Young Moore and Henderson, P.A. was honored when Bob Clay became “Of Counsel” to the firm, where he continued to serve as a mentor and a model of civility, zealous advocacy and of law practice as a profession. The visitation and funeral are scheduled for Tuesday, April 17, 2018 at Longview Baptist Church on New Hope Road in Raleigh. The visitation will be at 1 p.m. and the funeral will follow at 2 p.m.